Egyptian matchmaking startup Harmonica has raised $150,000 from the 23rd batch of the Silicon Valley global accelerator, 500 Startups. 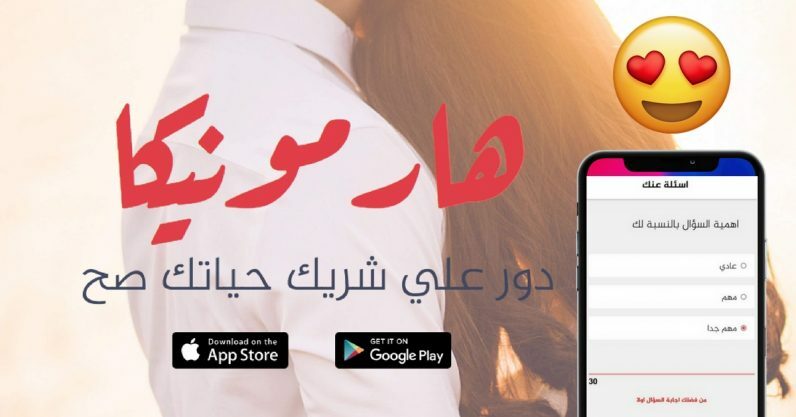 Founded by Sameh Saleh, Tamer Mohamed, Shaymaa Aly, and Aly Khaled last year, Harmonica has developed an Arabic-only app that aims to help people find their life partner. “We are over 350 million people in the Arab world and no one in the region in the recent past has tried to use technology to solve one of the biggest problems; matchmaking. We are trying to do that with Harmonica,” Sameh Saleh, co-founder and CEO of Harmonica, a veteran startup founder, told me. I gave the app a try just to see how it works and its onboarding process was pretty smooth. A bit too long, but that’s because they want to learn as much as possible about you and the kind of partner you’re looking for. When you download and sign up, the app has you answer 30 questions. That’s the very first step even before you type in your name. Each one of those thirty questions is broken down into three parts; yourself, your partner, and the degree of importance that particular question has for you, as shown in the screenshots below. While answering the questions for yourself you can only select one option, but when answering the same question for your potential partner, you can choose multiple options. The questions that have been designed by certified psychologists cover education, professional life, life views, habits, dressing style, and a lot more. One may argue that some of the questions are controversial, but it’s clear how much work has been put into designing them. After these questions, the user is asked the regular details including their full name (which they can choose to hide), city, religion, and date of birth. They’re also asked to choose the city they prefer their partner to be from and the desired age range. After the signup process is complete, a timer on the screen tells users to wait. Harmonica then runs their algorithm to match people based on the answers from the signup process questions every day at a fixed time. What’s most interesting about this app is that it doesn’t stop at matchmaking. The startup has an in-house team of relationship coaches who are available to chat with users and help them with relationship advice until they get married. The startup initially spent six months experimenting with 500 men and 500 women to refine their algorithm. “Most of the dating apps that you’ll find today are either from the West or influenced by the region. There’s nothing that is made keeping the conservative Arab population in mind. We are doing that. Harmonica is not for casual dating. In fact, we match you with only one person so you cannot even chat with anyone else within the app,” Sameh said, explaining what sets Harmonica apart fromother dating apps in the market. Started in late 2017, the app already has more than 70,000 users. Sameh and his team who initially bootstrapped the startup want to use their latest investment to further improve their algorithm and expand their team. Harmonica was also part of Flat6Labs Cairo’s last cycle. Many won’t find it easy to trust an app to help them find a life partner. The idea of an algorithm finding them someone might be frightening to many, but there will be many will want to give it a try anyway, even just for curiosity’s sake. Who knows, in the process they may end up finding their life partner after all. The startup will use a freemium subscription model to make money. It will be interesting to see how it does in the long run as a user will likely need only need the appuntil they get married. This could mean a high churn rate if their algorithms are successful. Harmonica is one of those startups that will perhaps be laughed at, even ridiculed, because of the nature of the problem it is trying to solve. But if it strikes the right cord, it could very well be the next big thing from the region.